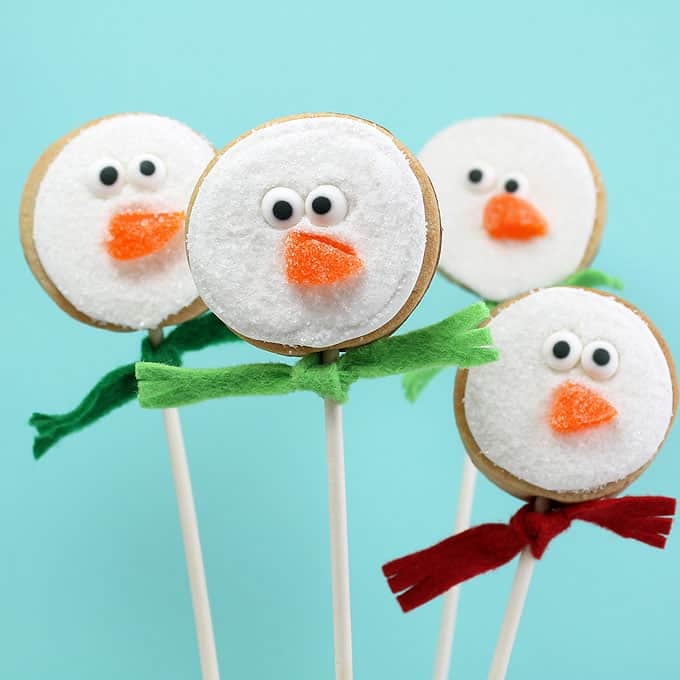 How to make easy snowman cookies on a stick. 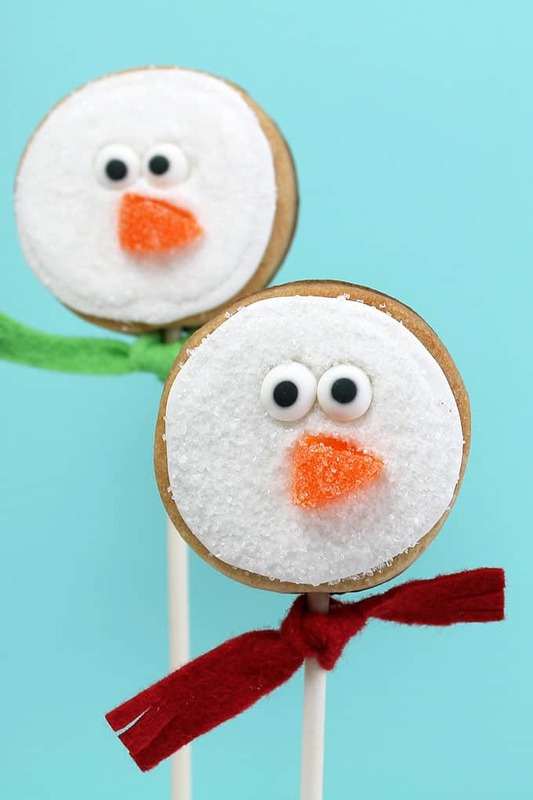 OK, so maybe these easy snowman cookie pops look just a little bit like ducks. Maybe. But how many ducks wear felt scarves? 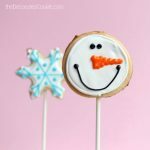 I’m hoping the time of year will make things more obvious, because these snowman cookies are really easy to decorate. The snowy sprinkles coat the white icing so you don’t need to worry about perfection. For the noses, I used orange gumdrops, but you can use any orange candy or sprinkle you think is carrot-like. Note: Use any size circle cookie cutter you prefer between 2 and 3 inches in diameter. Find the cookie cutter, cookie sticks, disposable decorating bags, coupler, decorating tip, sprinkles, candy eyes and felt in the craft store. For food coloring, I suggest Americolor Soft Gel Paste, Bright White, available in specialty stores and online. 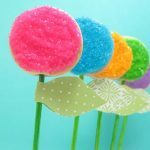 Check out my tips on basic cookie decorating to help with this simple edible craft. Roll out your cookie dough according to the recipe, about 3/8-inch thick. 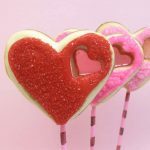 Cut out circles and carefully insert cookie sticks. Arrange on a baking tray lined with parchment paper and bake according to the recipe. Let cool completely. Prepare royal icing according to the recipe and tint white. Prepare a decorating bag with coupler and tip, fill with white icing and close tightly with a rubber band. 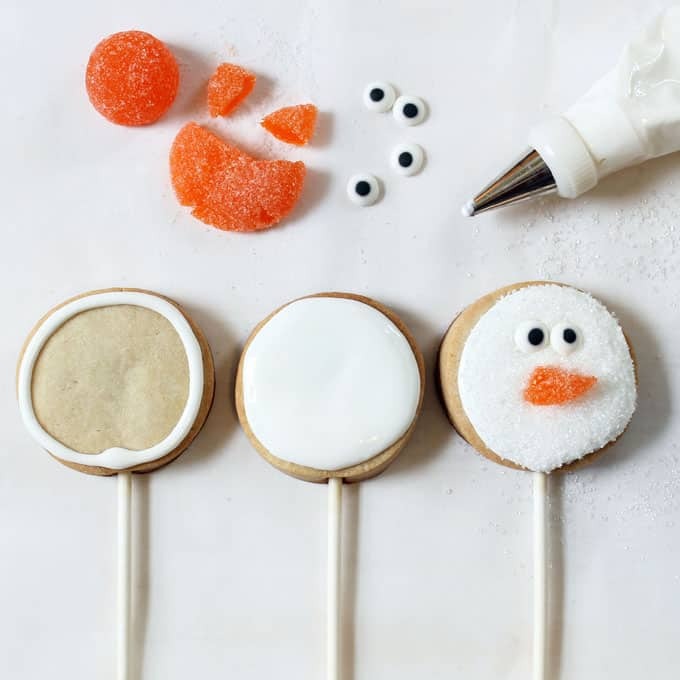 On a surface coated with granulated sugar to prevent sticking, flatten a large, orange gumdrop with your palm. Snip wedges to create the carrot noses. Set aside. Pipe a circle outline on the cookies. Working with one cookie at a time, pipe back and forth to completely fill the circle with white icing. Immediately coat with sprinkles, turning over to remove excess. Press candy eyes and a gumdrop wedge into the icing. Repeat with all of the cookies. Let the cookies dry very well, preferably overnight. If desired, cut long, thin rectangles from felt and tie around the cookie sticks for scarves. Ha! I just snorted coffee! I’m not a duck lol! It’s those eyes!! I made “spooky” popcorn mix last year and I swear I saw melting chickens instead of spooky eyeballs. Congratulations on your new Christmas baby! So happy everything went well. 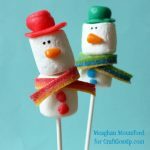 🙂 ..I LOVE the scarf on these little cuties..yes, snowmen! 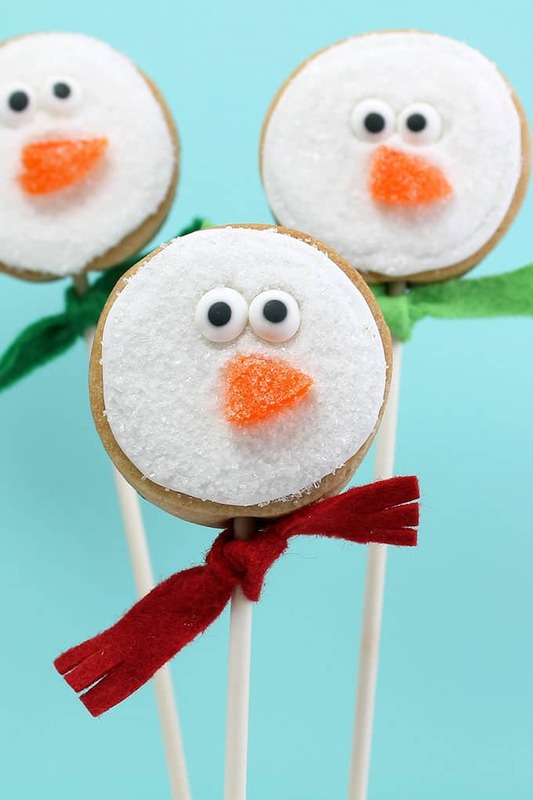 I have slight snowman addiction so I find these adorable.